hello there. i am Andrea limjoco — product designer, working on the spotify mobile experience. currently design lead for podcasts. i am also an illustrator and art director. Read my full bio here or my interview with Spotify.Design, where I talk about my recent work, the things that inspire me and how I got started designing things for people. Currently, I am leading the design team in Stockholm and London to introduce podcasts on Spotify. 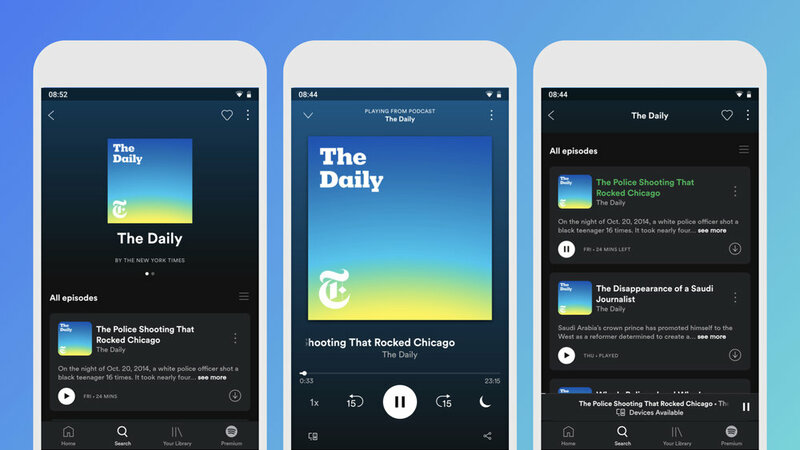 As a lead designer, I design the end-to-end podcast experience on Spotify mobile. I also help grow the team; set up ways-of-working; and, together with tech and product, define the strategy for the podcast product. For a long time, we prioritised the Spotify Premium product. So in 2015, we set out to reimagine what Spotify Free could be. Read more about it here: Personalized Discovery: Listen to Music You Love with All-New Free on Spotify. The challenge of this project was to create a great experience for our listeners on free while taking into consideration music licensing limitations. The result is a free product that is easier to use and accessible to more and more music fans. We created a unique playing experience on Spotify for the launch of Stranger Thing Season 2. This was in collaboration with the team at Netflix. It was a fun little project that was loved by fans of both Spotify and Stranger Things. The artist experience on streaming services has always been mimicking the physical way of experience the artist catalogue. For this project, I redesigned the artist experience by thinking about fans are listening to the artist they love and have discovered. And designing an experience that best to serve those needs in the streaming world. Descended from Radio, Daily Mix is our take on user's music taste, organised through 1 or more bottomless playlists depending on the variety of music you stream. Mixes are regularly updated and evolve along with your listening habits. Daily Mix makes it simple to quickly tune into – and tune between – user's favourite stuff, any day of the week. We keep similar artists grouped together, no maintenance required, and we throw in some discovery tracks too. Glue is the Spotify Design Language. Glue helps shape and evolve the design language of Spotify across all platforms, helping create a consistent user experience across all our products. Read more about how we scale design and product at Spotify. The Spotify experience on the big screen that really focused on the listening music at home - through people's SmartTV, Chromecast and Gaming Consoles (Playstation). In 2016, we refreshed our Spotify Icon suite - carefully creating and implementing over 600 individually crafted icons that works across our all of our products. You can read more about this project in this article. We worked with Collins in defining this new identity. After we launched in 2014, I worked with the design team to bring this new brand identity to life - in all our communications as well as into our product. Read more.